Goods that are required to be registered with the state cannot be imported onto the territory of Russia unless they are accompanied with the SRC. The certificate expires once the production of the imported goods is over and it is no longer imported to the Russian Federation. The state registration procedure as well as the registry maintenance is stipulated in the Common Form. State registration is mandatory for all goods that are part of the Common List compiled by the Customs Union Commission. It’s essential to note that state registration should be performed prior to other assessment procedures, including conformity assessment, declaration, fire safety assessment, etc. 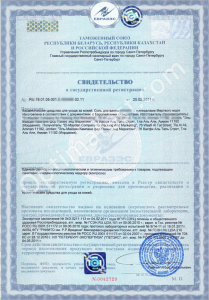 State registration certificates are issued by the Russian Agency for Health and Consumer Rights (also known as Rospotrebnadzor). Goods subject to state registration can be imported into Russia by the manufacturer as well as by third-party importers. By law, Rospotrebnadzor has 30 days to issue a State Registration Certificate (SRC), meaning you should apply for this document in advance. To speed up this procedure and avoid typical mistakes, contact ROSTEST. It is 100% lawful to delegate the state registration procedure to an accredited certification center.